A study of over 7000 young adults between the ages of 20 and 24 showed persistent neck and upper back pain associated with time spent text messaging. 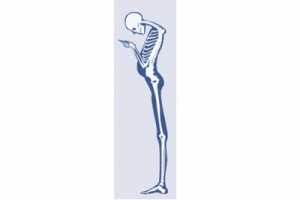 Accelerated neck and mid-back spinal degeneration becomes a likely side effect of the forward head flexion often experienced through texting. The increase in disc pressure during flexion contributes to disc degeneration and poor spinal health. 2) Text with two hands to create more symmetry and minimize spinal imbalances. 4) 20 second stretch – pull your arms and shoulders back while tilting your head up to look up at the ceiling or sky. Do the 20-second stretch at least once every hour. 5) Regular wellness visits to the Chiropractor. Electronics aid in work, play, recreation, and communication. The body remains the most important device at everyone’s disposal. Ensure the body operates at optimal functional levels by keeping the spine and nervous system in peak performance with regular trips to the Chiropractor. Spine J. 2017 Jun;17(6):901-902. “Text neck”: an epidemic of the modern era of cell phones?